Christian Mayer, Les Vues de l’Amerique du Nord (Visions of North America), 2008, wallpaper. Installation view, 2009. Belgium is just full of surprises these days. This exhibition, curated by the young Austrian artist Andreas Fogarasi, features the work of several artists living in Vienna. Fogarasi’s contribution to the show, Antwerp Sights/Architecture, 2009, consists of two tiny buildings extracted from Antwerp tourist maps, affixed to large white cardboard panels, and framed under glass. Working on the threshold of architecture, Fogarasi often explores social engineering in his work; here the Antwerp sport stadium and new courthouse by star British architect Richard Rogers appear as both landmark buildings and icons of tourist marketing, a change that all city maps now confirm. In their collaborative work Les Archives des Barbares (The Archives of the Barbarians), 2003, Anna Artaker and Meike Schmidt-Gleim playfully explore cultural associations of the word barbarian, particularly associations as “the other.” One work lists conceptual variations on the term in a pseudoscientific diagram sketched by hand. The chart moves from BARBARIAN to BARBAPAPA (a cartoon character) by way of BRA-BURNING and COCA-COLA. In addition to this work, the artists have created a book that depicts several hundred photographs from other texts to form a narrative on the multiple meanings of the word. 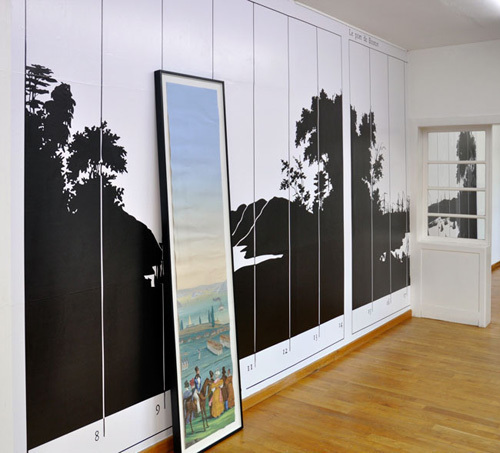 Christian Mayer’s wall-based work, Les Vues de l’Amerique du Nord (Visions of North America), 2008, is an abstraction based on an image titled “Beautiful New World,” which originally appeared in nineteenth-century wallpaper murals. An obscenely naive idealization of homeland and travel, a section of this wallpaper (that the artist acquired at auction) is framed and leans against his work. Offering a sharp critique of bourgeois fantasies, the familiar and the foreign, and the realm of territorial possessiveness, the work is just one example of the wide-ranging political, critical, and conceptual positions in this show.